Our project is assisting the community in creating a shared understanding about cultural competence. Since March 2017, more than five hundred individuals that provide services in the community have benefited from this training. A minimum of a two-hour training (optimal three hours), provides information about cultural diversity, cultural competence, self-awareness, cross cultural dynamics, and strategies for community integration. The presentation features a Central American community as an empirical example to integrate the various concepts discussed. The program is offered by Mr. Matthew Peters, Executive Director of the Multicultural Resource Center. 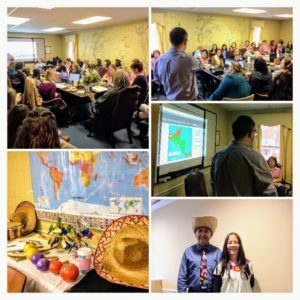 His extensive experience in cultural competence is a result of living more than a decade in Rural Guatemala, and serving the Hispanic Community in the Eastern Shore since 2012. Dr. Lorelly Solano, Coordinator of the Talbot Language and Cultural Competence project, also provides support to the program and shares her perspectives as a Hispanic member of the community during the discussions. Free cultural competence presentations are available for Talbot County businesses and organizations. Please contact Dr. Lorelly Solano at lorelly@chesmrc.org to coordinate a presentation for your staff!